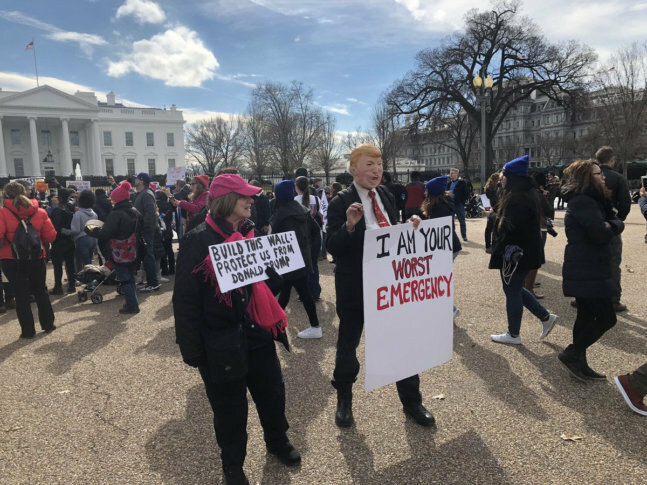 Activists gathered in D.C. this Presidents Day to show their disagreement with President Donald Trump's decision to declare a national emergency along the southern border. See the video. WASHINGTON — Activists gathered in D.C. on Monday, Presidents Day, to show their disagreement with President Donald Trump’s decision to declare a national emergency along the southern border. MoveOn mobilized activists Monday to “defend our democracy and immigrant, Muslim, black and brown communities from Trump’s dangerous national emergency power grab,” according to its website. The protests are part of a national movement. Rallies were planned in D.C. at Lafayette Square in front of the White House and in Maryland at the Whole Foods in Columbia and at Courthouse Square in Rockville. Overall, illegal border crossings are down from a high of 1.6 million in 2000. The American Civil Liberties Union filed suit challenging Trump’s emergency powers declaration within hours of the announcement.